My piece for today is a sidewalk chalk drawing. I've gotten into the habit recently of drawing on our driveway and this seemed like a fun opportunity for a Terrible Yellow Eyes. 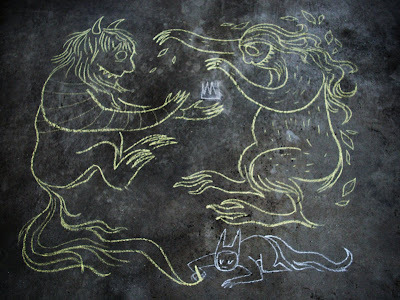 If you like, stop by my blog to see some of this drawing in action as well as a couple other monsters drawn in chalk leading up to this piece. Thank you for stopping by! That's all the Terrible Yellow Eyes for today -- have a great Friday! Be sure and check back every Friday morning for more TYE!